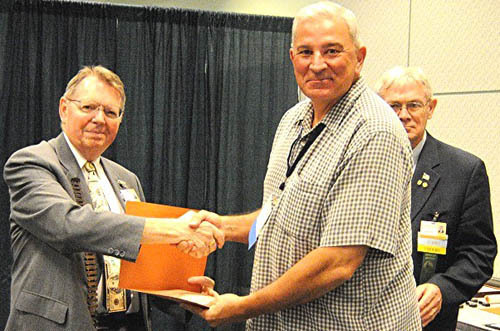 Al Raddi accepts the club’s 25 year membership certificate from ANA Governor Joe Boling as ANA President Cliff Mishler looks on. September 5, 2009—The fun began on Wednesday August 5, 2009 when we set-up the CONECA table at the American Numismatic Association (ANA) World’s Fair of Money at the Los Angeles Convention Center. 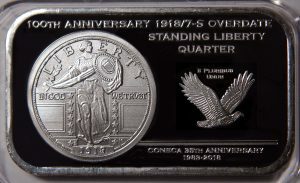 Special thanks to Tim Clough, Mark Lighterman, Al Raddi, and Phil Shattuck for loaning some eye-catching error and variety coins to our display cases and to Alan Herbert, Mark Lighterman, Jon Leese, Walt Ostromecki, Al Raddi, Phil Shattuck, and Mike Turrini for taking shifts at the table. 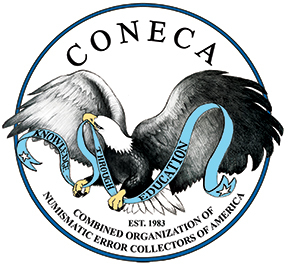 The Combined Organizations of Numismatic Error Collectors of America (CONECA) has planned its Errorama celebration in conjunction with the American Numismatic Association (ANA) World’s Fair of Money in Los Angeles, CA August 5 through 9, 2009. CONECA members and their guests are invited to an awards banquet in a room at the convention center on Friday August 7, 2009 from 6:30 to 9:30 p.m. 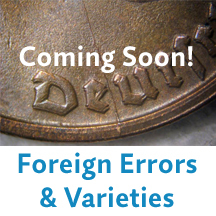 In addition to good food and the presentation of the annual CONECA awards, there will be an illustrated talk entitled “The Lincoln Cent: Rich in History and Rich in Your Pocket” by Mike Ellis, senior grader and variety specialist at Dominion Grading Service and CONECA Past-president. There will also be drawings for door prizes. Banquet reservations were $40 per person, purchased through Al Raddi. Errorama plans also include a club table at the show where members can gather to talk and share their finds. This is where members will also have their last crack at purchasing CONECA 25th Anniversary Medals, which go off sale after the event. The annual combined meeting of the board and the membership is scheduled from 9:00 to 10:30 a.m. Saturday August 8, in a room at the convention center. Cherrypickers’ Awards for the best variety and error found at the show will be conferred from later that day from 3:00 to 4:00p.m. in a room at the convention center. Those wishing to exhibit under the Numismatic Errors and Varieties class (Class 14) may contact the ANA Exhibit Coordinator. Additional information on exhibiting including tips for building a winning display may be found at: http://www.money.org. Learn more about The ANA World’s Fair of Money Summer Convention as the ANA posts it here: http://www.money.org.